SSC/Dakhil Result Board Challenge 2018 has been published. Only a Teletalk Prepaid SIM require completing SSC/Dakhil Result Board Challenge 2018. 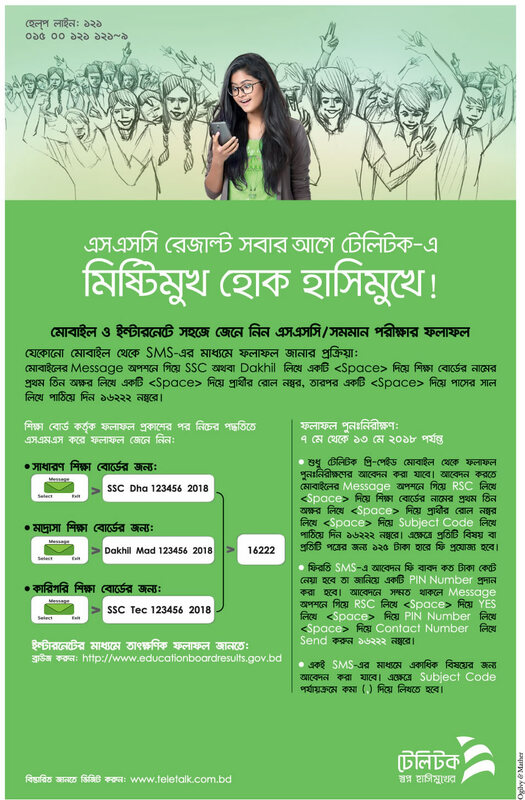 Requests to review exam results can be made through state-run mobile operator Teletalk between May 7-13, 2018. The SSC/Dakhil result board challenge process is very easy. First, find out the subject code of your desired subject that you may want to request for Mark sheet. Then, recharge your Teletalk Prepaid Mobile Number Account. Re-Scrutiny Fee: Single subject required the fee 125 TK and joint subject required the fee 250 TK (Like Bangla, English, etc.) After recharging mobile account, go to the message option and type the below info. In reply you will get an SMS which will let you know how much application money will be charged and a PIN number will be given to you through SMS for confirmation. NB. You can apply for more than one subject in a SMS, subject codes will be divided by comma (,). The Important factor of second message is the Contact Number is very essential here. Result or Further Information will be sent to the contact number of the above procedure. Tags: How To Recheck SSC Dakhil Result, SSC Dakhil Board Challenge Result , SSC Dakhil Re-Scrutiny Result 2018, SSC Dakhil Rescrutiny Process 2018, SSC Dakhil Rescrutiny Result 2018, SSC Dakhil Rescrutiny Result 2018, SSC Dakhil Rescrutiny Result 2018, SSC Dakhil Result 2018 Re-Scrutiny Process, SSC Dakhil Result 2018 Rescrutiny Process, SSC Dakhil Result Re-Scrutiny Process, SSC Dakhil Result Recheck process 2018, SSC Dakhil Result Recheck process 2018, SSC Dakhil Result Rescrutiny 2018, ssc result 2018, ssc online, board result, education board result bd, ssc result bd, education result bd, education board result, education result, education board ssc result, ssc result app, education board bangladesh, dhaka education board result, dhaka education board, hsc education board, education board bd, bd result, bangladesh education board, dhaka board. How To Recheck SSC Dakhil Result, SSC Dakhil Board Challenge Result , SSC Dakhil Re-Scrutiny Result 2018, SSC Dakhil Rescrutiny Process 2018, SSC Dakhil Rescrutiny Result 2018, SSC Dakhil Rescrutiny Result 2018, SSC Dakhil Rescrutiny Result 2018, SSC Dakhil Result 2018 Re-Scrutiny Process, SSC Dakhil Result 2018 Rescrutiny Process, SSC Dakhil Result Re-Scrutiny Process, SSC Dakhil Result Recheck process 2018, SSC Dakhil Result Recheck process 2018, SSC Dakhil Result Rescrutiny 2018, ssc result 2018, ssc online, board result, education board result bd, ssc result bd, education result bd, education board result, education result, education board ssc result, ssc result app, education board bangladesh, dhaka education board result, dhaka education board, hsc education board, education board bd, bd result, bangladesh education board, dhaka board.